Well done Autodesk. I can see the issue that most Revit 2008 insulations had with Windows Vista in getting Revit files to have a thumbnail preview has been resolved with Revit 2009. For the majority of large offices that confine them selves to Windows Exlporier this is a really great. Trying to navigate libraries with out thumbnail previews is very difficult. 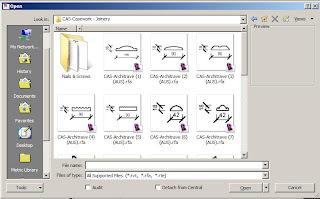 I have revit 2009 installed in a brand new dell pc, and its turns out that the thumbnails for common libraries just doesn´t seems to show up. Do you know if maybe there´s a solution for this matter? First. Are your family files all upgraded to Revit 2009 format. They won't display if they are Revit 2008 family file format icons. Second. Are you using Vista 64 or 32 bit. If you are using Vista 64 bit you will need to have the current build RAC2009 - 20080915_2100 (WU2) of Revit.